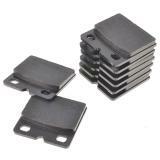 Brake Performance Parking Brake Pads are manufactured using the same positive molding process utilized by Original Equipment suppliers. Positive molding uses extreme pressure to compress the friction material and bond it to the backing plate. This process assures consistent friction material density throughout the pad, resulting in even wear and performance characteristics throughout the life of the brake pad. 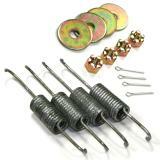 The brake friction features either precision cut or shaved backing plates and mechanically attached shims. In addition to these features a scorching process has been added to all of the Parking Brake Pads. This additional process forces any impurities out of the friction material and pre-burnishes the pads to greatly accelerate the break-in process. These Parking Brake Pads have the highest temperature fade resistance and friction level of any Brake Pads we sell. 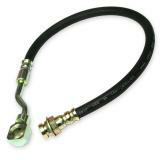 Manufactured from premium quality semi metallic materials. 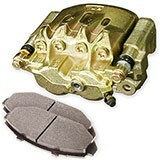 Brake Performance Parking Brake Pads are guaranteed to fit your and factory vehicle's Hardware. 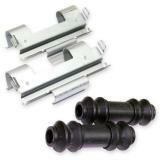 You can install them with no worries about factory fit or quality. We do recommend you have a certified mechanic install them for proper fit and function. Recommended for any vehicle that uses Parking Brake Pads. If you have any questions or need assistance choosing the correct Parking Brake Pads for your vehicle call our brake experts toll free at 866-756-5536.